I ordered a Tiger McKee design holster and one of your mag pouches a while back and I had to let you know that I am 100% happy with the purchase and they are my favorites out of all that I own. I love Kydex for some reason so, I own many of them, I have holsters made by nationally known companies and I have a high dollar, custom made by hand holsters. Your holster stands at the top of the heap. I have paid $100 dollars only to end up with a holster that was so sloppy loose that it was basically useless. I have compared many side by side with yours and the quality of your holsters are easy to see, Thicker Kydex and a no-nonsensee design sets yours apart. Rock solid construction with sensible simplicity, It works well and it works everytime. That’s what it’s all about. Keep up the great work, your doing it right! Thank You for some great products. I have ordered a total of 4 pocket holsters for use with this new gun. My order from you was the most recent because it looked like the best of the bunch for my needs. I believe if I had found you first, I could have saved a bunch of money. I’m very pleased with your design and execution. Regarding form, it’s amazing how hard it is to find a pocket holster with a smooth outer surface to reduce or eliminate “printing” without resorting to a separate piece which adds unnecessary bulk to mask a poor design. As far as function is concerned, it’s questionable if most holsters will remain in the pocket 100% of the time when the gun is drawn. Your design assures that the holster will not accompany the gun. I expect yours will be the one I use most. Thanks for the modest cost, painless ordering and quick delivery of a quality product. Alan…Just got the green IWB for the Mil-Spec. I’m not a huge fan of Kydex as I have over 80 holsters, 95% leather. But Kydex is thinner inside the jeans and the best feature of your IWB is the solid loop of Kydex, not a couple of rubber bands like B****-Tech. Tried it on and it’s like it’s not there. And the retention screws are perfect and because of the solid belt attachment, it stays put. I’m sold on YOUR design, mainly due to the one piece Kydex loop. So what if the trigger guard gets worn as I can always have it parkerized over and over. Great product, great price and quick turn around. My son, Todd, finally did order my AHolster IWB tuckable for my Glock 23 and I must say, thank you. I have had it for 3 weeks now, (ok, he was tardy about Fathers Day) and worn it many times. However, today was the first time I was able to fully utilize it in my monthly tactical study group and Alan, this holster is awesome. Comfortable, yes, but pretty near daily wear had proven that. Today on the range, with almost 30 draw presentation and roosters, it performed like an old friend. Thank you. Just wanted to drop you a note. I ordered a holster from you and received it last week. Man, you hit the nail on the head!! Great Product!! I have purchased more than a few holsters for several different 1911’s over the years. but yours tops em all. Perfect weapon fit, super comfortable to wear etc. Could not be happier. Will spread the word at my Gun Club (with a ton of retired USMC guys). The guys at the club who have seen it have loved it. The holster arrived the day I sent you the email! I love it. I just got back from Memphis where I was shooting in the IDPA Tri-state championship. While I did not use the holster for the match, I did use it everywhere else I went. Very comfortable for all-day wear. I usually carry IWB at about 4 o’clock on my hip, and while that conceals well, it eventually puts a strain on my hip and lower back. Your holster sits high enough that it was well concealed by an untucked shirt and spread the weight and pressure of the pistol so that there was no discomfort in my hip or back. Would You like to share your Aholster experience with us and the community? Drop us a line below and we may feature your testimonial on this page! The Aholster Company appendix wedge holster is just like all the other appendix Kydex holsters out there except for the added Wedge feature. The wedge adds padding between the user and allows the user to adjust the position of the grip in relation to their body and position on the belt (see video). This allows for a more comfortable carry as well as a quicker transition when drawing the weapon from the holster. The wedge will also cut down on the movement (slide, rake, cant) of the holster while worn properly on the belt. The Kydex is .080″, colored options available. Nothing fancy or new here, just a little common sense. Belt Aholster. If you like the concealability of an inside the waistband (IWB) with the comfort of an outside traditional holster, you will like this holster. The belt holster is molded (bent) to conform to the curve of your hip and waist when worn in the 4 or 8 o’clock position on your belt. This helps to reduce printing and keeps the firearm and its grip tucked tight against the body. The weight of the firearm is carried evenly across your belt, unlike many traditional single point carry holsters, using 2 rubber adjustable straps (1.25″ to 1.75″.) The straps simply wrap around the holster and your belt and are snapped with the Pull-the-Dot (directional) safely snaps used on most military and police issued equipment. Easy on, very easy and quick off. .080″ Kydex. The design has a 15% rake allowing a complete firing grip on your weapon with it still in the holster. The mag release of your weapon is accessible while the firearm is holstered to allow a practical reload. It has several options including a sweat guard, adjustable retention, and an open bottom design to help keep debris from collecting in the holster. It is available right or left handed. This holster is also a good choice for the ladies being that it works well with their natural curves unlike most of the other holsters on the market. It has become popular with all folks, male or female, small or not so small, and the short or tall. The belt holster is a practical and comfortable option to carry your weapon, especially for those that like the bigger traditional caliber weapons. The Shootrite Aholster has the sight catch option and .090″ Kydex. IWB / Inside the Waistband design. Right or left-handed. 15% Rake. Belt attachments available in 1.25″ to 1.75″ widths in belt loop and J-hook styles. This holster is available in a Tuckable IWB option. Adjustable retention. Sweat guard. Open bottom design. .080″ thick Kydex. The mag release is accessible while the firearm is holstered to allow practical reloads. These Aholsters are designed to wear just behind the hip with a practical belt. The IWB, IWB Tuckable, and the smaller PWII Aholsters are available on the order page. Aholster Mag Pouch. Several different mag options available (see order page.) Designed to wear right or left handed carry, ammo forward or rear carry. Adjustable retention. .080″ Kydex. NO hardware will come into contact with your mags. Clip over belt attachment. Mag pouch will keep mag close to the body to help reduce printing. AR-15 mag pouch. Designed to wear right or left handed carry, ammo forward or rear. Adjustable retention. PMAG compatible. Clip over belt attachment (easy on, not so easy off.) Again, NO hardware will come into contact with your mags. No one that utilizes an AR-15 mag fed weapon should be without. 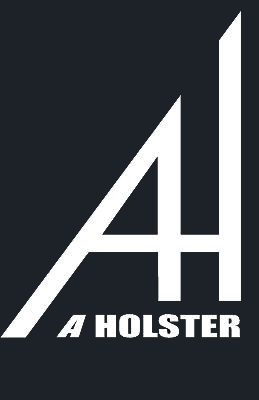 The Aholster Company pocket holster is considered by some to be one of the best Kydex holsters on the market today. We specialize in Kydex concealment holsters. The Pocket holster is one of our top sellers. It is used by civilian and law enforcement for an everyday practical way to carry a backup weapon as well as in some situations, a primary. The Pocket is available in right or left-handed carry. This design is meant to be worn in the front pocket of your pants. .060″ Black Kydex, .080″ Colored Kydex. It is molded to curve with the leg to reduce printing and helps to keep the firearm in the perfect position to draw your weapon if needed. The outer side of the holster is rounded outward to keep the profile of the weapon to a minimum. Drop your holstered firearm into your pocket and it practically disappears. Unlike many of the other holsters on the market, you can get a complete firing grip on the weapon with it still in the holster (without altering the holster.) The mag release is covered to keep the mag from being released without your knowledge. Simply draw your weapon out of your pocket and the upper or lower hook of the holster will grab the seam of your pocket leaving the empty holster in place. If needed, the aggressive hook on the bottom of the holster will allow you to rake the weapon and holster across an object to draw the weapon one handed in any situation that the combo is not in our pocket. No fancy tricks, it just works. The Aholster Company Backbone pocket holster is very similar to our standard pocket Aholster. All the same great features with the added benefit the slimmer profile being that the cylinder of the revolver is cut out. The Backbone is only available for our revolver line. The thickest part of the weapon/holster combo has now been slimmed down as far as possible to help with printing that a revolver typically shows. This holster has been shortened to help with those not so deep pockets. Kydex .080″ in multiple color options. We specialize in Kydex concealment holsters. The Pocket holster is one of our top sellers. It is used by civilian and law enforcement for an everyday practical way to carry a backup weapon as well as in some situations, a primary. The Pocket is available in right or left-handed carry. This design is meant to be worn in the front pocket of your pants. It is molded to curve with the leg to reduce printing and helps to keep the firearm in the perfect position to draw your weapon if needed. The outer side of the holster is rounded outward to keep the profile of the weapon to a minimum. Drop your holstered firearm into your pocket and it practically disappears. Unlike many of the other holsters on the market, you can get a complete firing grip on the weapon with it still in the holster (without altering the holster.) Simply draw your weapon out of your pocket and the upper or lower hook of the holster will grab the seam of your pocket leaving the empty holster in place. If needed, the aggressive hook on the bottom of the holster will allow you to rake the weapon and holster across an object to draw the weapon one handed in any situation that the combo is not in our pocket. Get notified about our newest products upcoming sales and industry news. Drop us a line, Aholster would love to hear from you! We are so confident that you will LOVE our Custom Kydex Holsters we want to give you our absolute BEST OFFER just to try us out! If you don’t agree that Aholster products are the best Custom Kydex Holsters on the market, you can return it for a full no-questions-asked refund!